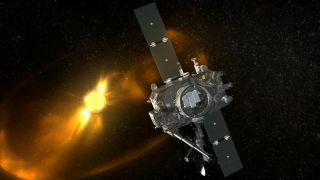 NASA has restored communications with the STEREO-B solar observatory, seen here in an artist's concept, after nearly two years of silence from the sun-watching spacecraft. The probe went silent on Oct. 1, 2014. NASA has finally re-established contact with a sun-watching probe that was thought to be lost in space after it abruptly went silent in 2014. A signal from the long-lost spacecraft, called STEREO-B, was detected Sunday evening (Aug. 21) by NASA's Deep Space Network, a collection of space tracking stations that follows the agency's space missions across the solar system and beyond. NASA scientists had kept vigil for STEREO-B, making monthly searches for the probe until it phoned home Sunday at 6:57 p.m. EDT (2257 GMT). "The STEREO Missions Operations team plans further recovery processes to assess observatory health, re-establish attitude control, and evaluate all subsystems and instruments," NASA officials wrote in a statement. The STEREO spacecraft twins (their name is short for Solar and Terrestrial Relations Observatory) were launched in October 2006 and were originally supposed to last until 2008. With an extended mission, however, came challenges. For example, the orbits of both STEREO spacecraft went behind the sun in 2015, for three months each. STEREO-B was initially lost when NASA was testing a command loss timer, which is a reset triggered during solar conjunction. Conjunction was expected to happen between January and March 2015, when STEREO-B's orbit took it behind the sun, putting it out of contact with Earth.Both STEREO spacecraft have a command loss timer that resets the spacecraft every 72 hours when it is not communicating with Earth. In 2014, controllers deliberately stopped communicating with STEREO-A to test this process, and it worked perfectly after reorienting itself with respect to certain guide stars, and sending a signal to Earth. With STEREO-B, however, the test did not play out as planned. The hard reset did occur, and STEREO-B sent a weak signal to Earth. But the spacecraft quickly faded into silence. Only a few packets of data made it to Earth, but from that, the team concluded in December 2015 that the inertial measurement unit (which tells the spacecraft if it is rotating, and how fast) gave incorrect information into STEREO-B's guidance computer. At the time, NASA concluded that this set the spacecraft into a spin that left its solar panels out of sunlight most of the time, making it difficult to recharge the battery. The team could have easily fixed the issue if STEREO-B had remained in contact, but at the time, the contact was too brief to take action, NASA added in 2015. NASA said in a statement at the time that this meant that "the spacecraft is drifting in space with incorrect information about how it's moving — a big problem for a spacecraft that needs to keep itself pointed at the sun to stay powered on."